This robot has six arms and, regarding the mechanical design field, is a simple robot; in order to get the motion ability, it depends on a number of motors that connected directly to the motion axes according to each arm. Each arm has three degrees of freedom (3 DOF), all of these degrees act as a rotation motion, and so, the robot has full flexibility to move and rotate in all directions. Twenty small Servo motors have been used, they don’t rotate a complete circle, but they do rotate (200) degrees only. 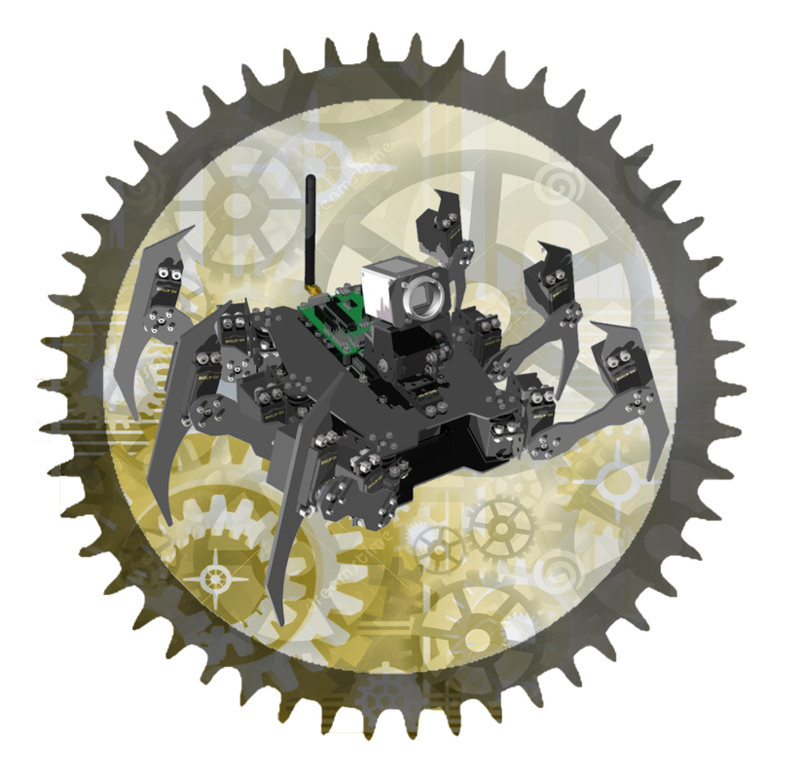 Three Servo motors have been installed to each arm of the spider robot (for each degree of freedom we need on motor). The robot is provided with a high quality industrial camera, (656×494) pixels, and the camera itself is provided with two rotational degrees of freedom by assembling it to a special base which has two Servo motors to give it the ability to rotate in two perpendicular directions. All Servo motors can rotate to (60) degrees within (0.18) seconds as maximum when they are run by (6) volts, and they rotate to the same angle within (0.23) seconds as minimum when they are run by (4.8) volts. The torque of each motor according to the previous voltages is (5.5 – 4.4) Kg.cm. The Servo motors are connected to a microcontroller system consists of: A Servo motors controller from the type of (SSC-32) according to Lynxmotion company, this controller can drive (32) Servo motors at the same time, (20) ports have been used from them. This controlling circuit is connected to an Arduino controller from the type of (RB-Lyn-363) according to the past company under name “BotBoarduino” and it’s usually used for robots controlling and programming. A “Lipo” kind battery is used with capacity of (5000) mAh connected to a voltage regulator and saver. The robot can be controlled wirelessly by using a Bluetooth circuit provided with an external antenna to improve the signal strength, the sensing average is (110) meters in an open aera. The application fields that this can be useful are the fields of dangerous nature and the space science fields, it may suitable to surveillance job for search and rescue job to find victims in area that can't be reached by human, it also can be used in the military fields as a method of spying and another special operations.